The Browsing Room Gallery at the Downtown Presbyterian Church is proud to present an exhibition of recent artwork by Jana Harper - Blessing the River. 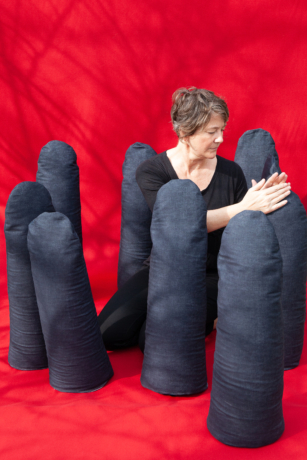 About the Artist: Jana Harper is an interdisciplinary artist whose work explores the themes and tensions between materiality and transcendence, chance encounters and human willfulness, relationships and connectivity, and human acts of meaning making. Originally trained as a printmaker, her work takes many forms, and she works both individually and in collaborative settings. Her work is held in several public collections including the Library of Congress, the Sackner Archive for Visual and Concrete Poetry, J.S. Blanton Museum, Proyecto Ace Print Collection, and the Janet Turner Print Collection. She is a recent recipient of a National Endowment for the Arts award in support of her project This Holding, which will premier at OZ Arts Nashville in 2020, and in May, her collaborative performance Cargas will be a part of Intermittent Rivers, the Matanzas portion of the Havana Biennial. Jana is associate professor of the practice in the department of art at Vanderbilt University.